D. R. Fraser Taylor, recipient of the 2014 Killam Prize, introduced the world to the power of cybercartography, an enhanced form of multimedia mapping. On October 28 at 5:30 Prof. Fraser will participate in a moderated discussion exploring the impact of cybercartography on trade and economic patterns, international development and the risk of homelessness. Professor D.R. Fraser Taylor, will deliver the Killam Prize Lecture on Oct. 28. On Tuesday, Oct. 28, Killam Prize winner D.R. Fraser Taylor, will participate in a moderated discussion about cybercartography, an enhanced form of multimedia and multisensory mapping that makes Google Earth seem behind the times. Cybercartographic atlases are highly interactive by design and are intended to be accessible to a wide-variety of people with different abilities and styles of learning. Anyone with an Internet connection can enter content into the atlases, including voice entries in multiple languages, video, photographs and documents. Researchers are currently working to make it possible to input smells, tastes and even emotional cues into the atlases. In addition to introducing the world to cybercartography, Prof. Taylor has extensive experience in developing nations, especially in Africa where he worked for six years as an education officer in rural Kenya. His interest in strategies for sustainable development among indigenous communities led him to Canada’s north, where he and his research teams have introduced cybercartographic mapping to remote communities via the Nunaliit data management platform. With the participation of people of all ages, tools that make it relatively simple to create interactive mapping web sites are now “bringing to life” previously unmapped territories. Storytelling is a key feature of the Nunaliit atlases, highlighting lived experiences in connection with geographic features. Cybercartographic techniques have multiple applications, for example, interactive atlases are providing researchers, municipalities and policy makers with the means to engage and visualize the distribution and complexity of risk of homelessness in Canadian cities. 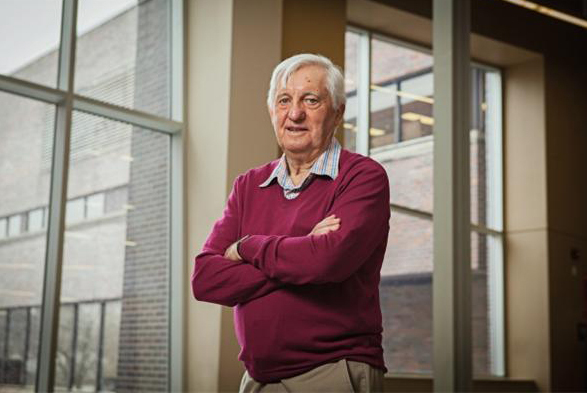 Prof. Taylor has also led cybercartographic studies of Canada’s world-wide trade patterns. In advance of his talk, Taylor spoke to the McGill Reporter. Don’t miss Prof. Taylor in discussion as part of the Killam Prize Lecture series on Tuesday, Oct. 28, 5:30 p.m. to 6:30 p.m. at the McGill Faculty Club. Register online. For more information, go here. Please note that seating is first-come, first-served. A reception will follow. Almost all of us use maps, but few of us are engaged in map-making. Why is it important to let people become creators of cybercartographic maps? It is true that most people still use maps as way finding devices but maps are much more than way finding devices. There are many ways of expressing spatial concepts rather than the traditional map, such as performances, art, music, etc. Cybercartography is multimedia and multisensory and uses many forms of presentation, only one of which is a traditional map. The key here is the presentation of all kinds of quantitative and qualitative information linked by location. It is important in my view that the Inuit, for example, are able to express their own social concerns as well as their own [ways of being] rather than having these reflected by outsiders. Given this, we believe that it is important for people to choose what they consider important to “map” rather than have this decided for them. Even in the creation of the more traditional way finding maps there is a need to empower people to make their own maps. Often there are no detailed maps available, or those that are available are out of date. The mapping of Haiti using Open Street Map, created through crowd sourcing, is a good example of this need in action. You argue that the maps produced by Google and other companies are ultimately commercial tools for advertising and marketing, whereas cybercartographic maps are democratic in nature. How do you ensure that the ownership of the information you gather stays with the people who have given the information? Why is this important? Too often information given by communities to outsiders has been misused or abused. Often this results in representations which are contrary to the true picture. [My research team] is working with a team of lawyers to develop new licensing approaches to help communities to retain control and ownership of their information. They can decide if they wish to share the information, and with whom. We are also working on creating a distributed data management system for northern communities with servers residing in each community rather than in a central data centre in the south. Recently it was revealed that Inuit testimony led searchers to the Franklin shipwreck. How is cybercartography helping to preserve the unique geospatial knowledge of people in Canada’s north and in other rural places where “traditional maps” are not readily available? Cybercartography records and preserves the stories of the elders in a number of ways. The elders are a major source of [geospatial] knowledge but our Atlases include a wide range of traditional knowledge. We consider our atlases to be “living maps” in that as they are community driven they are constantly updated by the community. Maps of the emotions are being created by my colleagues at the Technical University of Vienna. They are using crowd sourcing technology such as cell phones to allow people to express emotions such as fear as they move through the streets of Vienna. Women for example often feel less safe on some streets than others. These maps are interactive and in real time.